Looking up at Campanile in Midtown. Talk of the town this week centers on a Dewberry Capital Corp. affiliate closing in on acquiring the Campanile, BellSouth's former headquarters at 1155 Peachtree St. in Midtown. Multiple sources have confirmed that Dewberry has the 20-story, 428,755-square-foot office tower under contract for $30 to $35 million, or more than $70 per square foot, vastly below replacement cost. The building is approximately 80 percent vacant. Eastdil Secured is marketing the Campanile on behalf of a Wells Fargo affiliate, which foreclosed on the property earlier this year after Transwestern Investment Co. forfeited on a $98 million loan originated in 2007. Eastdil executives declined to comment. Dewberry Capital Corp. executives did not return calls. According to one source, Dewberry has coveted the property for years, and, if Dewberry Capital can cross the goal line with the acquisition, the Campanile would add to its Midtown office holdings, which include I and II Peachtree Pointe. Other contenders for the Campanile reportedly included Cousins Properties, Brookdale Group, Tishman Speyer and Daniel Corp.
Our sources tell us The Paces apartment community at 77 East Andrews Dr. is one of the most sought after redevelopment opportunities in metro Atlanta and maybe the Southeast, but one question remains as we travel bumpy economic roads. "It's a great piece of property from a location perspective, but the big question is what do you do with it today?" one source asks. A CB Richard Ellis team of Paul Berry, Malcolm McComb and Kevin Geiger is marketing The Paces on behalf old-line Atlantan John Grant and his family and received bids for the property last month. Berry declined to comment. The 30.1-acre site has 250 existing apartment units, but it's primarily being marketed as a redevelopment play and could fetch $50 million, one source indicates. The development has combined 3,300 feet of Roswell Road, East Andrews and West Paces Ferry frontage. The Paces also has been mentioned in the mix of sites for an Atlanta Public Schools' Buckhead high school. Don't talk business with Vantage Realty Partners' Gene Rice on an empty stomach. Vantage has been on a roll of late, leasing intown retail and restaurant space at mixed-use projects from the Old Fourth Ward to West Midtown. Rice, partner Chris Carter and Vantage Senior Associate Matt McGee have represented ownership in leasing more than 10,000 square feet of restaurant and retail space at Perennial Properties' Pencil Factory mixed-use development downtown, adding Hill Street Tavern, Scoop ice cream shop, Beignet Connection, Mr. Blackwell's Caf� and Caramba's. Vantage also leases the retail space at the Candler Building downtown and recently added Rising Roll deli to its retail mix. In West Midtown's Apex mixed-use development at Huff Road and Ellsworth Industrial, Vantage welcomed Corner Tavern and Java Lords, each with an established presence in Little Five Points, as well as a 2,800-square-foot pizza joint. On the tenant rep side, Vantage's Mindy Elms and McGee have worked with a mouth-watering lineup including Flip, Bocado, Miller Union and 4th & Swift. Rice and Carter started Vantage in 2007 after beginning their careers with Cartel Realty and Southeast Property Advisors. Since its inception, the company has carved a niche with intown mixed-use development, whether working as brokers, consultants on development and design of the retail side or property management in emerging neighborhoods like the Old Fourth Ward, Inman Park and West Midtown. "That's where we wanted to be, and that's where the deals are happening," Rice said. Left to right: Jay Padgett of Jones Lang LaSalle, John Thornton of CBRE, Luke Pope of Republic Property Co., Chip Watson of Avison Young, Jeff Henson of CBRE, Jesse Kelley of CBRE and Bret White of CBRE. 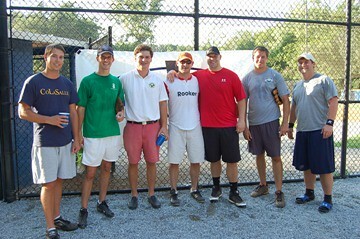 The Rooster stopped by Pace Fields this week to see how our broker friends are doing in the softball league playoffs. Tuesday night's winners include Carter, CBRE and the Bandits. Wednesday night's winners include Cushman, CBRE and Pattillo (although Pattillo took out Cushman in the end). Curious about the standings? We have them right here. Republic Property Co.sponsored both games with everyone's favorite, Low Country BBQ and Sweetwater brew. See you next week for the semis! Quite possibly, the most interesting Rooster in the world. Team Rooster looks forward to celebrating our one-year anniversary with you tonight at Tavern 99! Big thanks to sponsors Colliers International, Sanctuary Park, Fidelity National Title, Troutman Sanders and Choate Construction. See you at 5!